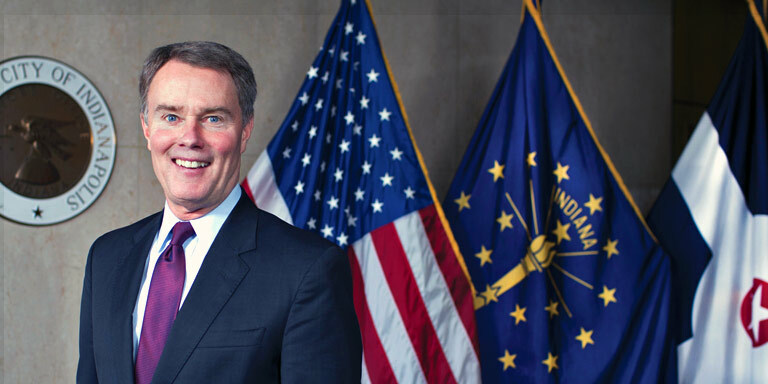 With his master’s in history from IUPUI, as well as degrees from IU Bloomington, Indianapolis Mayor Joe Hogsett (M.A. ’07) knows the campus and the university well and recognizes the pivotal role IUPUI plays in his vision for the city. He sees the campus as an economic driver and an agent of change, serving Indianapolis neighborhoods, creating opportunities for education at every level, and providing quality health care by training this city’s health care professionals. According to Hogsett, “You can think of almost any aspect of quality of place and quality of life, and IUPUI is a ready-made asset to be utilized for the betterment of the long-term health and well-being of our community.” Looking toward the future, Mayor Hogsett anticipates an increasingly strong relationship between the city of Indianapolis and IUPUI as collaborators on ways to attract and educate the next generation. >> There’s no better investment, I think, that anyone can make for your own personal development, for your own personal growth, than to expand your educational horizons. When I was campaigning for mayor, I had many young people who would listen to my standard stump speech and would politely and respectfully come up to me and say, you know, we really appreciate your perspectives but nothing that you talked about is of interest to us. So I would say to them, well then what are the issues that motivate you? And almost uniformly, they would say, how are you gonna keep our friends here in Indianapolis? How are we going to retain the millennial generation? So that Indianapolis can be a destination city? It really, I think, is fundamental to the long term well being of our city, and the long term well being of IUPUI, for us to collaborate in ways that attract people to go to school here, and then after they’ve completed their schooling, they’ll want to stay and live, and work, and play. Five to ten years from now, I think that IUPUI and the city of Indianapolis will find each other almost codependent and coexistant. You know, 25, 30 years ago, it may not have been a close relationship. But with our current chancellor and the administration here at IUPUI, I think that the city and the university’s relationship is closer than it ever has been before.